A sculpted face with smooth and chiseled contours is sought after not only by models, celebrities and those in the media, but by anyone wanting to attain an aesthetically pleasing face. Puffiness or heaviness in the cheek area can mask the contours of a beautiful upper cheekbone and lower jawbone. This fullness or puffiness can often be contributed to what is called Buccal Fat. Buccal Fat is the fat pad that is found in the cheek area and extends up into the skull. The Buccal Fat Pad is comprised of three areas, and the area which can show cosmetically is the fat pad residing specifically in the cheek area. This plumpness appears just above the jaw line and lip. Many patients complain about fullness in this area which may, or may not be attributed to Buccal Fat. Sometimes fullness in the cheek area is due to other medical conditions and/or disfigurement due to previous surgery, accidents or trauma; however, in those circumstances where Buccal Fat is the culprit for puffiness and fullness in the cheek, a minor surgical procedure can be performed to reveal and enhance the contour of the upper cheekbone and lower jawbone. What is Buccal Fat Excision Surgery? Plastic Surgeon Dr. Slupchynskyj’s Buccal Fat Excision Surgery is a procedure which entails a small incision on the inside of the cheek around the area of the molar teeth. The incision is gently opened using a surgical scissor and the Buccal Fat presents itself between the “Massater” muscle and the soft tissue of the cheek. The Buccal Fat is then gently teased out, as it flows freely out of the incision as yolk from an egg. 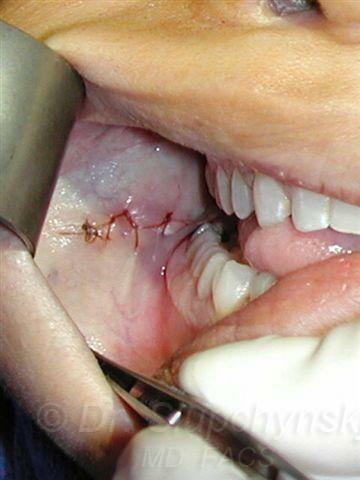 Once the Buccal Fat has been extracted, the small 2 cm incision is closed using an absorbable suture. There are no visible scars in this case and oral incisions heal quickly. What are the benefits of Buccal Fat Excision Surgery? 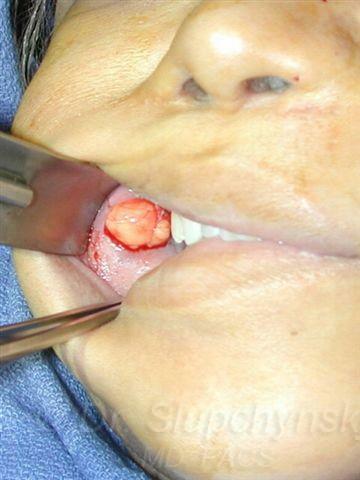 Buccal Fat Excision Surgery is effective and safe. Buccal Fat Excision Surgery can be performed under local anesthesia. Buccal Fat Excision Surgery results are permanent. Buccal Fat Excision Surgery enhances the contours and lines of the upper cheekbone and lower jawbone. 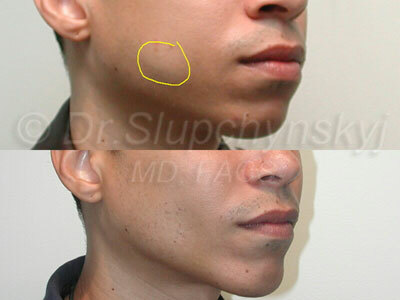 Buccal Fat Excision Surgery utilizing Dr. Slupchynskyj’s technique does not have any visible scarring and heals quickly. Buccal Fat Excision Surgery helps to sculpt a poorly defined face with roundness or plumpness in the cheek area. Buccal Fat Excision Surgery can be performed in conjunction with other procedures such as Rhinoplasty, Chin Augmentation, Blepharoplasty, Lip lift, Facelift, SLUPlift™ MiniLift and Mid Facelift. Is Buccal Fat Excision Surgery right for me? As always, good health and realistic expectations are necessary for any successful result in cosmetic surgery. Buccal Fat Excision Surgery is a good choice if you have excessive puffiness or plumpness in the cheek area which was not as a result of trauma, accident or previous surgery. 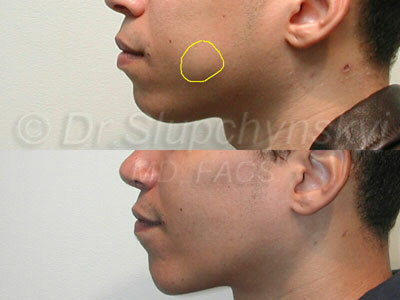 Buccal Fat Excision Surgery is also a good choice to enhance your cheek and jaw bones. During your consultation, Dr. Slupchynskyj will closely examine your facial features and cheek area and thoroughly describe what you can expect from Buccal Fat Excision Surgery. Last, risks, which may affect surgical outcome, will be discussed. my Buccal Fat Excision Surgery? Buccal Fat Excision Surgery is performed under local anesthesia and light sedation. The procedure is performed on an outpatient basis and lasts approximately one hour. There is typically a small amount of swelling and no bruising post operatively. It takes approximately one month for swelling to resolve completely and up to three months for the final result. Are there any risks associated with Buccal Fat Excision Surgery? What is my recovery time? Dr. Slupchynskyj will advise you to avoid any strenuous activity until he is confident you are healed. Dr. Slupchynskyj will also advise when you can return to normal activity, which for most patients, is within one to two weeks post surgery. Many patients return to work within five to seven days. Your incision was made orally, so you will be advised to chew soft or liquid foods and maintain excellent oral hygiene during the healing process, as lack of oral hygiene increases risk of infection. How long do the results of Buccal Fat Excision Surgery last? Will Buccal Fat Removal Affect My Jaw or TMJ? No. The removal of the Buccal Fat Pad does not affect jaw function. Swelling, while present, can temporarily decrease the range of motion of the jaw, but this will subside as the majority of the swelling goes down. 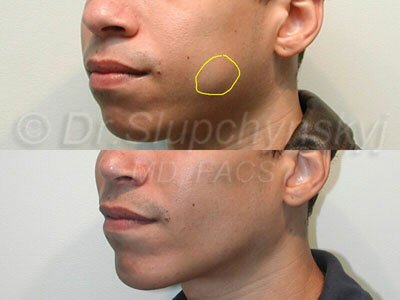 Does Buccal Fat Removal Surgery Affect the Masseter, Buccinator or Pterygoid muscles? No. By removing the Buccal Fat Pad intra-orally (through the inside of the mouth) Dr. S. avoids those muscles, as the Buccal Fat Pad is closest to the inside tissue of the cheek. How large is the Buccal Fat Pad? While this varies patient to patient, Buccal Fat Pads are typically the size of a ping pong ball or golf ball. Approximately 5 cc to 7 cc are removed per patient. See the diagram and photo below. 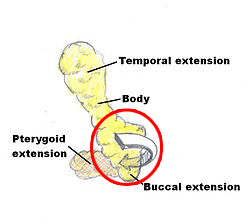 There are 4 components to the Buccal Fat Pad: the temporal extension, the body, the pterygoid extension and the buccal extension. 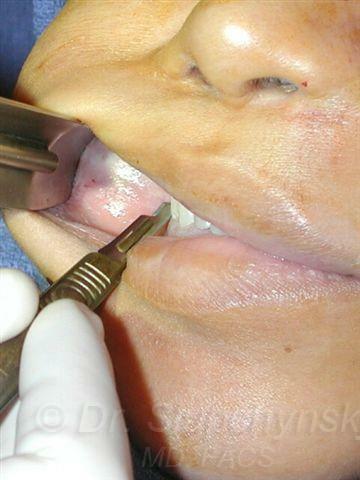 In the procedure known as Buccal Fat Removal, the Buccal Extension, circled above in red, is removed. The photo below shows 2 of the removed components. 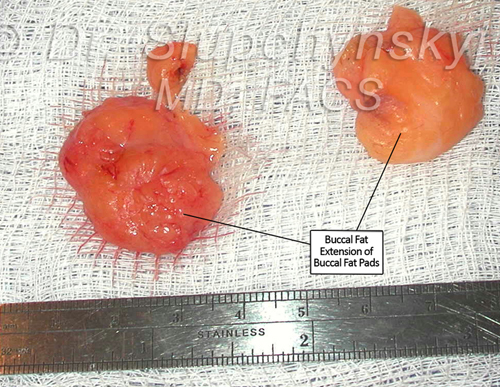 Actual Buccal Fat Pads after surgical removal by Dr. Slupchynskyj. Can anything be done to help diminish or prevent the swelling? Dr. S. typically prescribes a decreasing dosage of medication that helps prevent inflammation. While swelling will occur regardless, this medication often decreases the magnitude of the swelling. The following photos show the process of Buccal Fat Removal. 26 year old African American male patient who desired a stronger appearing, more defined chin and jawline as well as more definition in his cheek area. 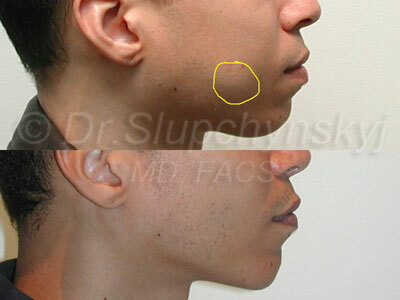 Dr. Slupchynskyj utilized his facial contouring techniques by removing Buccal Cheek Fat and placing custom carved jaw and chin implants resulting in overall improvement of facial symmetry and balance.Note that the Buccal Fat is outlined in yellow in the pre operative “before” photos. Note the absence of excess fullness in the post-operative views. Contact our office today to find out why people choose Dr. Slupchynskyj and Buccal Fat Excision!